I’d heard about the wild festivals, sunset celebrations and Ernest Hemingway’s six-toed cats. But I’d never heard how charming Key West was, with dozens of palm-tree lined streets and homes bordered by white picket fences. The entrance to NYAH was no exception. Key West isn’t your average city and the residents are proud of it. The city’s motto is “Close to Perfect, Far from Normal.” So, it’s fitting for my first stay on this small island in big demand was in less-than-normal accommodations. 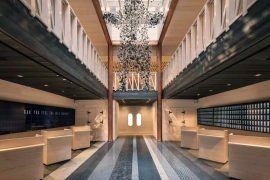 With a name like NYAH – Not Your Average Hotel – you know you’re in for a new experience at this Key West hotel. The bonus? 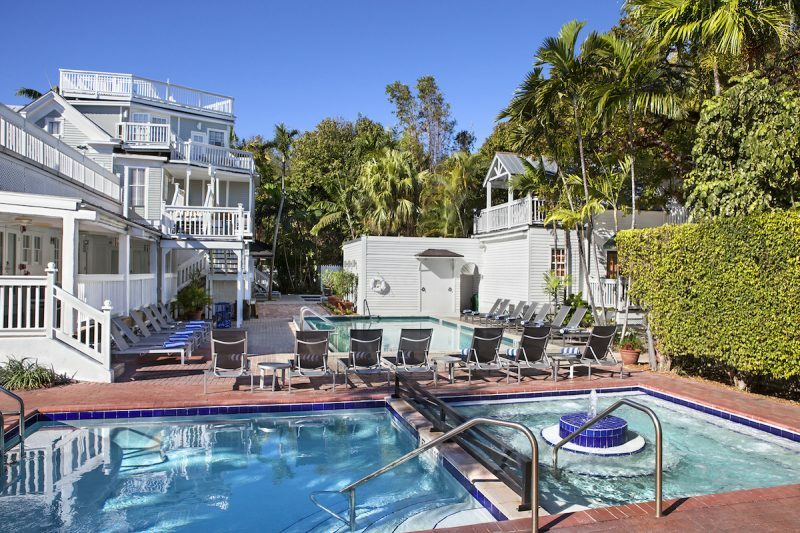 It’s one of the most affordable hotels to stay in Key West. You won’t find fancy room service, Jacuzzi tubs or giant closets with plush robes. But you’ll find plenty to love in this charming hotel. Here are five reasons I recommend NYAH for a stay on this quirky island destination in Florida. 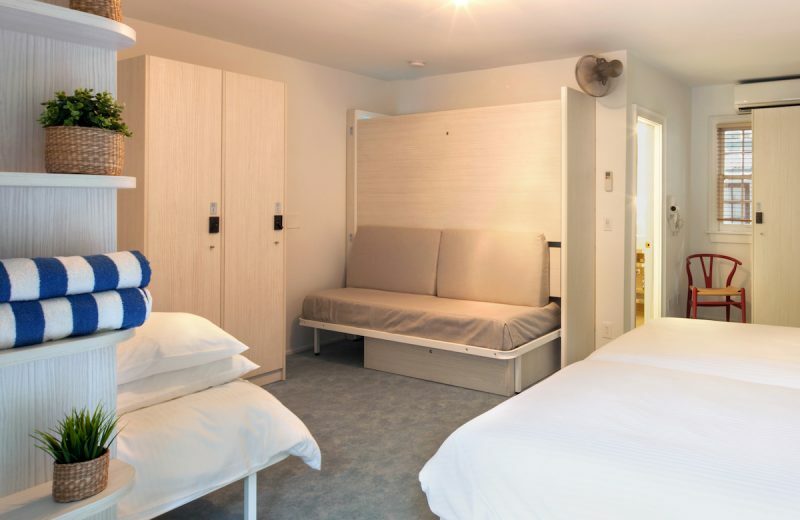 Some rooms at NYAH can sleep up to six people. This room has been customized with a king bed, twin bed and sofa. 1. You can customize your room to sleep from 1-6 people. 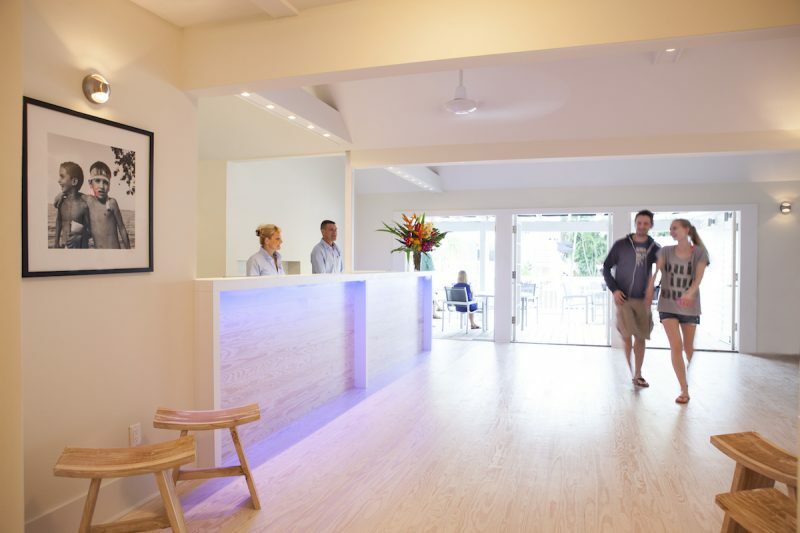 The reason NYAH is the most affordable place to stay on Key West is that you pay one price for your room, whether you have one person or six. NYAH created the BYOR system – build your own room. You can choose to have a king-sized bed, a sofa, six twins or other combination of rooms. Each bed is super comfy with a memory foam mattress and a small nook beside it with a plug to charge up your devices. I could keep my things tucked away in my personal locker that I opened with my hotel key. And wifi is free and easy – an amenity I always appreciate. I’ve spent too much time with tech people serving hotels where I’m paying more than $25 a day for it. And it doesn’t work. 2. 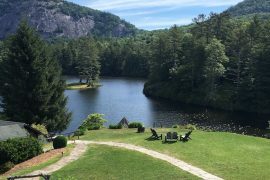 NYAH has several front porches and decks with great views. Because it’s made up of what was once four properties, there are several buildings that make up NYAH. And like many other properties here, they have porches to enjoy outdoor time. My room included a front porch that I shared with one other room, and I never saw the other resident. I enjoyed chilling out on my porch, tucked a few feet back from the street behind a white picket fence and lush green bushes. Take a few flights of stairs up in the outdoor common area and you’ll find a few lounge chairs and decks for taking in expansive views of Key West. There are no high-rises so your view of the tree-lined streets and setting sun are unobstructed. NYAH has four pools, which were never crowded during my stay. And striped towels may not be such a selling point for most people, but I have a passion for blue-and-white stripes and loved NYAH’s towels. 3. NYAH has four pools, plenty of lounge chairs. And cute striped towels. One reason visitors love Key West is the warm temperatures year-round. You won’t find blazing heat here in the summer or the chilly winter nights of some parts of Florida. Even in December and January, the average day-time temperatures are in the 70s, so guests can hop in the pool any time of year for a refreshing swim. Although the hotel had plenty of guests during my stay here, I always saw available lounge chairs, with those cute rolled-up striped towels that I love. 4. The location is perfect for walking to local attractions. As soon as I settled in my room I set off to explore Duval Street, the main drag in Old Town, then stopped to visit the Ernest Hemingway Home and Museum, all within an easy walk. Key West is flat so there aren’t even any hills to navigate and I could easily explore. We were also able to walk down to Mallory Square in less than 20 minutes. NYAH also has bicycles available to rent if you prefer to sightsee on two wheels. The design at NYAH is minimalist, as you can see from this lobby view. A complimentary breakfast is served on the patio off the lobby, overlooking the pool. The hotel has free wifi, and did I mention you have to be 21+ to check in here? 5. This Key West hotel has free breakfast and fun happy hour. With those temperate climates, dining al fresco is a delight, and the free breakfast is set up poolside under a covered porch every morning. I opted to use a tray to take mine the short walk back to my front porch where I could use the small table and enjoy a leisurely meal. NYAH hosts a happy hour every day from 4:20 to 5:20 (See? Not your normal happy hours, right?) with complimentary cheese and crackers. It you’re looking for high-end luxury, look elsewhere. 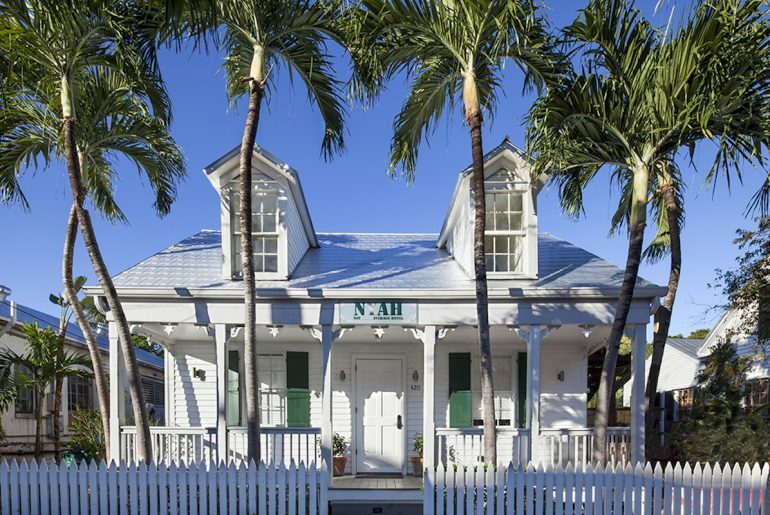 But if you’re looking for an affordable, well-located property with its own share of that quirky Key West spirit, give NYAH a chance. 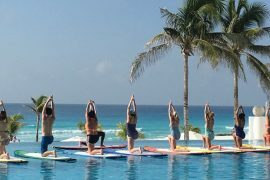 Because sometimes far from normal is just what you need.